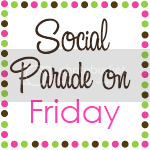 Social Parade Follow on Friday Blog-Hop is a weekly link-up hosted by Smart and Trendy Moms . We created it for socializing and to get new followers, subscribers, readers without feeling overwhelmed. Every week will be a new link-up that will focus on following blogs. I LOVE BLOG HOPS ~ SO HOP ON OVER AND JOIN IN!!! IF YOU ARE HERE FROM THE HOP ~ WELCOME!! LEAVE ME A COMMENT AND I WILL FOLLOW YOU BACK!! Following you thru GFC. New to blogging and just getting the hang of it a little. Still terrified I will mess something up. But I will get over it, just takes time. Found you through the blog hop. Hope you can come by my blog Im just getting started but would love to have you. Hello :) I'm following you from the Social Parade! Hope you'll follow back. Have a great weekend! Following from Social Parade! Hope you'll follow me too :) Have a great weekend! Following you from social parade. Please stop by. Happy Friday !